At Bromsgrove we recognise the importance of an academically rigorous education; it is important that pupils are stretched in order to make good progress and ultimately gain the best achievable set of academic qualifications. However, there is more to a quality education than this and we are also committed to producing individuals that are fully prepared for life beyond school and who possess the skills and personal qualities to succeed in a changing and increasingly globalised world. There are many ways in which we achieve this; in our Early Years and Primary Sections we build the foundations of a love of learning and the fundamental skills that will make them life-long learners. We also provide a balanced and accessible programme of extra-curricular activities, a world-class boarding environment, excellent Pastoral Care and a commitment to improving levels of confidence, inquiry and communication as a student moves through the school. These experiences will ultimately help them to be happy and successful both at school and beyond. The Bromsgrove System is a seamless continuum based on the British Education System, but where the Asian influence enriches all that we do. Each section of the school effectively prepares a student for the next so that their education is smooth, continuous and each stage builds on the progress made in the previous one; our Early Years is ideal preparation for the Primary School which in turn equips our students with the necessary skills and grounding to succeed at Secondary School. The end result is that parents do not have to worry about their child’s education being disrupted by them having to settle in to different schools and make new friends. At Bromsgrove Early Years the emphasis is very much on the individual care and attention given to our students. Our staff student ratio is such that each child can receive the support that they need. Development of English at this early stage is obviously important, but we are also equipping them with a love of school and the skills that they need to succeed in our Primary School. The fundamentals of language and numeracy are supported by creative learning, decision making and problem solving that make our students curious, independent and more effective learners. We also ensure that the transition to our Primary School is smooth and that the learning is continuous. 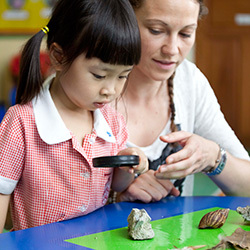 Primary School staff regularly visit the Early Years campus so that the students know who they are. The curriculum planning is done so that there is no break in their education and our Early Years students will often visit our Windsor Park Campus so they are familiar with the school environment. Within the Bromsgrove Primary School, students receive the fundamental building blocks of a quality academic education; a strong emphasis is placed on English, literacy, numeracy, the sciences and ICT. 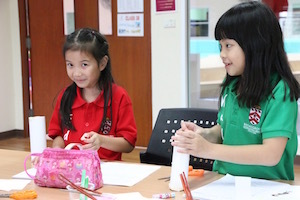 At the same time, through the development of key skills such as responsibility, resourcefulness and resilience we make our Primary students intellectually curious and better learners, while also building self-esteem and emotional intelligence. In this way we can accelerate their progress and prepare them more effectively for the challenges of our Secondary School and even life beyond. The Head of Primary works very closely with the Assistant Head (Academic) and the Lower Secondary Coordinator to ensure that the transition to the Secondary School is seamless. The students are perfectly prepared for their Year 7 courses, are familiar with the teachers and the campus and will move through the school with their friends. Academic rigour ensures that every individual is stretched so that they are given the opportunity to develop their potential in every subject. We continue to develop and care for the whole student and recognise and applaud achievements at every level and opportunity. In Years 7 – 9 they are taught a broad curriculum so that they can find and develop their strengths while receiving the academic grounding and acquire the skills that they will need to succeed in their IGCSEs. In Years 10 and 11 the curriculum becomes more focused and the students work hard towards the best IGCSE grades of which they are capable. In addition to their qualifications they are also acquiring the study skills and academic curiosity that will help them to succeed in our Sixth Form and at university. 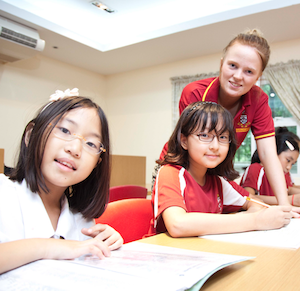 Flexibility is offered for students who might find a full programme of IGCSE study too much of a challenge with additional English being provided instead of one or two of the IGCSE options. In our Sixth Form, the curriculum becomes more specialised and students are able to develop a deeper understanding of subjects that will ultimately shape their university choices and adult careers. The students are stretched to achieve the best achievable AS and A level grades, but our Sixth Form experience is also designed to develop the independent study skills and love of learning that began in our Early Years School and continued throughout the Bromsgrove System which will then help them to succeed at university and in employment. Our students throughout the school benefit from an academically rigorous curriculum but we also recognise that there is more to a quality education than this. Students that leave BIST should also possess the personal qualities, skills and interests that will equip them to succeed in an ever changing global climate. Confidence, self-esteem, the ability to work effectively in a team, to lead others, to problem solve, to effectively propose and support an argument, and to create something that inspires others are just a few examples of the attributes that can be developed through a well-balanced extra-curricular programme. Be it playing in a sports team, performing as part of a choir or orchestra, acting in a play, debating or any other of the many opportunities offered in this programme, we are sure that parents will find activities that will help develop the individual potential of their son/ daughter; in an increasingly competitive environment, top universities and employers are looking beyond the qualifications to the individuals behind them. We are rightly proud of being able to provide a world-class boarding school experience based upon the best traditions of the British Boarding School system. There are many benefits that boarding can bring to the individual pupil in terms of their independence, confidence and academic progress; it really is the ideal preparation for university life and beyond. The boarding experience also represents more of an immersion into an English Speaking environment and so levels of English are likely to improve at a quicker pace. The friendships made in boarding will also last a lifetime; as a former Bromsgrove boarder once said, “the best thing about boarding is that I get to live with my best friends!” The boarding community at Bromsgrove is staffed by an experienced and dedicated team. 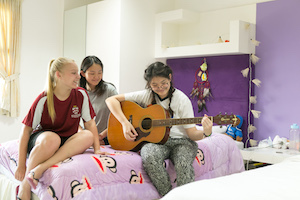 This helps us to ensure a safe, supportive and consistent environment where boarders receive a balance of academic support, practical activities and free time to relax with their friends. Our weekly boarders choose to go home on a Friday afternoon and spend the weekend with their families before returning to school on Sunday evening or Monday morning. Because of the structured support they receive during the week and the extra time they have saved by not having to travel to and from school, our weekly boarders are much more able to relax and enjoy time with their families. 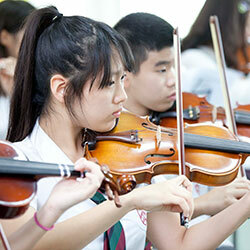 For this reason many students and families regard weekly boarding as ‘the best of both worlds’. We take care of the academic support, the motivation and the structure during the week so that family time is literally just that.